Taka Kigawa performed an ambitious program of 21st-century works at his annual Le Poisson Rouge recital on Monday. Taka Kigawa is a New Yorker, but you wouldn’t know it. This enthralling but elusive pianist typically has just one major recital here each year: an annual, single-night engagement at Le Poisson Rouge that is all too easy to miss. The house was full on Monday, when Mr. Kigawa played an ambitious program of 21st-century works, including Luciano Berio’s powerful Piano Sonata. But even if the lucky few there sang his praises, their friends would need to wait another year to hear why. Well, kind of. New York audiences will have another opportunity to hear him live on Dec. 10, when he plays a portion of Messiaen’s “Vingt Regards Sur l’Enfant-Jésus” at the Sheen Center in NoHo. Mark your calendars. 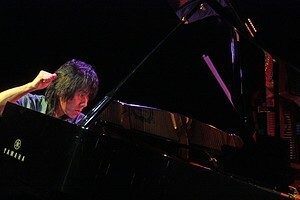 Mr. Kigawa is a Messiaen veteran; last year he played the marathon “Catalogue d’Oiseaux” at Le Poisson Rouge. Other recent recitals there have similarly homed in on a single composer, such as Ligeti and Boulez. This year, however, was different: four composers, from four countries and three generations. Each piece was from this century, but if they shared anything else, it was a subtle theme of opposing forces. In Akiko Yamane’s “Illuminated Baby,” they were progressive steps and chaos; in Beat Furrer’s “Phasma,” the player and piano; in Matthew Aucoin’s Three Études, a rondo and what the composer calls “little electric jolts”; and in Berio’s sonata, one courageous note and disastrous calamity. The highlight and heart of the evening was Berio, whose shimmering “Erdenklavier” provided the encore. His one-movement sonata, written in 2001, is a single note’s surprisingly poignant stand. It opens with a B-flat, powerfully struck and sustained by Mr. Kigawa, as if in declaration. Then the note continues, a little arrhythmically, occasionally interrupted by dissonant clusters. In the sonata’s middle section, the B-flat recedes as chaos dominates. But that little note is difficult to dislodge from the mind; its occasional appearance sticks out, all the more so in Mr. Kigawa’s interpretation. Is it possible to root for a musical note? I found myself doing as much when, despite tumultuous phrases lasting until the final moments of the sonata, a lone note emerged. Against all odds, it had persisted. “Illuminated Baby” and the Three Études were more playful. In Ms. Yamane’s piece, Mr. Kigawa played busy chords that evoked the bumbling steps of an infant, countered with nervous upward scales reminiscent of a Shepard Tone. He inserted similar anxiety into the second of Mr. Aucoin’s études, in which the melody seemed to hover uneasily in low flight, like the soundtrack of a moth flirting with a bug zapper at night. “Phasma” called for leaning over the piano to reach inside and pluck, stop and unconventionally sound the strings, as in one of John Cage’s prepared pianos. Mr. Furrer — a European composer who has written for the Vienna State Opera yet somehow remains relatively obscure in the United States — plays with the tension between sounds heard as if in superspeed and lingering ones. It’s a musical experiment. Who better to interpret it than Mr. Kigawa, with his endlessly curious mind? He rose to the challenge, his blazer off and shirt sleeves rolled up, as he let the audience into the laboratory.